Traditional social hypotheses have a built-in tendency to verify themselves and so involuntarily resist attempts at stereotype change or correction. This is the insight demonstrated and discussed as the start point for an alternative approach to the problem of stereotyping and hypothesis testing. 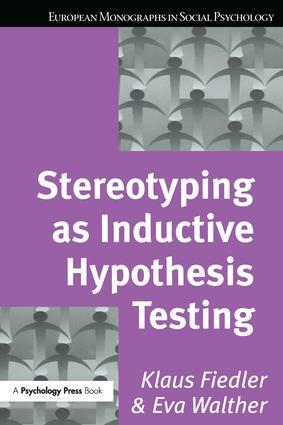 Stereotyping as Inductive Hypothesis Testing explicates the proposition that many stereotypes originate not so much in individual brains, but in the stimulus environment that interacts with and constitutes the social individual. This cognitive-ecological approach is then used to analyse the different aspects of language, sign systems and communication that can implicitly govern hypothesis testing procedures and lead to circular or reinforcing outcomes. The authors describe factors in tests such as judgment, memory and expectation and go on to suggest viable ecological learning approaches to them. An original research project based on a classroom situation is used to demonstrate and verify findings. The cognitive-ecological approach is then contextualised in relation to both the traditional approaches it can replace and the contemporary statistical sampling practices it can improve. Written with a profound understanding of the link between theoretical rigour and good empirical research practice this monograph will be invaluable to anyone with an interest in stereotyping or who wishes to enhance the reliability and self-awareness of their research methods. The European Monographs in Social Psychology series is published in conjunction with the European Association of Social Psychology, to support authored books for advanced students covering social topics that promote a European intellectual perspective to the rest of the world. The aim of this series is to publish and promote the highest quality of writing in European social psychology, and provide an outlet for new research in the field. At a time when cultural and political frontiers in Europe are being redrawn, there could hardly be a more appropriate time to promote a distinctively European intellectual perspective to the rest of the world. The editor and the editorial board encourage publications which approach social psychology from a wide range of theoretical perspectives and whose content may be applied, theoretical or empirical.